Entomology is a specialised branch of science that deals with the study of insects, vermin, scorpions, spiders and similar other species. It can be classified as a sub field of zoology, which is in turn a branch of biology. Sometimes known as insectology, entomology also deals with the study and classification of arthropods- an invertebrate animal having an exoskeleton (external skeleton), a segmented body and jointed appendages. Entomology is an enormous field of study, which has various subdivisions within it. These may include morphology, physiology, zoological categories of genetics, taxonomy, behaviour, ecology, nutrition of insects, as well limited forays into forensics and paleontology. The study of entomology can provide interesting clues into the history of life on Earth and it can also be used to make projections about the future. The study of insects serves as the basis for developments in biological and chemical pest control, biotechnological research and development, food and product storage. Entomology is an ideal career for those who are fascinated with the world of insects or animals and agriculture profession. Those who are involved in this field are termed as entomologists. Entomologists are biological scientists who work in the animal world carrying out insect explorations. They are experts who specialize in the identification, classification, observation and conservation of insects and arthropods. Entomologists examine insects and their relationships to plants, environment, humans, animals, agricultural sites and other organisms. They are the persons responsible for the identification of various species of insects, both harmful and harmless to plants, animals and humans. Entomologists study and carry out research activities on insects and related life forms based on their life cycle, physiological factors and so on. They work to protect the environment; sustain agricultural production; prevent the spread of disease; help farmers to produce food and save endangered species. Entomologists are also concerned with the study of urban pests, forest pests, agricultural pests and medical and veterinary pests and their control. They conduct research to develop new and improved methods and technologies to control or eliminate pests. Orthopterology - the scientific study of orthoptera, including grasshoppers, cockroaches, crickets, mantises etc. Job opportunities are available for entomologists in technical as well as administrative and research line. Working conditions of entomologists depend on the type of their job. 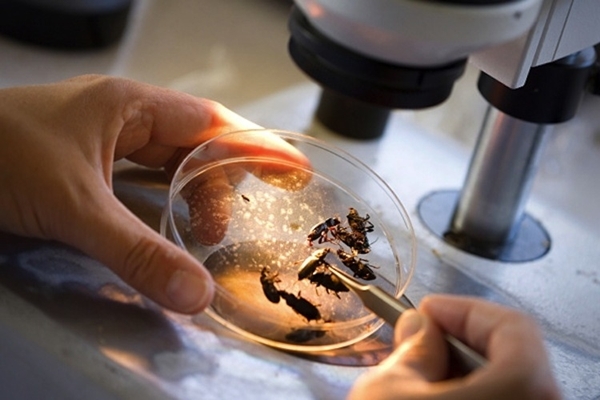 While some entomologists work in the field, others may work in the laboratory, classroom or find niches in regulatory entomology or the pest control industry.